ÄMARI AIR BASE, Estonia—A memorial site for Soviet air force pilots is hidden in the woods just outside the gates of this NATO air base. Some of the monuments are of stone, overgrown and weathered, engraved with a Communist red star and a fallen pilot’s name. Other memorials are made from a fighter jet’s vertical stabilizer fin, adorned with the requisite red star and a small photo. Collectively, these forgotten memorials are epitaphs to Estonia’s former Soviet statehood, as well as Ämari Air Base’s Cold War history as a front-line Soviet outpost against NATO. Yet, at this secluded spot on a clear summer day in August, the roar of U.S. Air Force A-10 “Warthog” warplanes broke the bucolic quiescence. A little more than a quarter century ago, the noise of those American jets, at this base 160 miles from the Russian border, would have meant war. However, on this day—26 years after the Soviet Union’s breakup, and 13 years after Estonia joined NATO—those U.S. warplanes were flying as part of a NATO exercise meant to reassure Estonia, and remind Moscow, that the Western alliance is ready to defend its members with military force. “Every exercise that we have with our NATO allies actually sends a pretty strong message to our people and to our potential adversary that NATO is united and that Estonia is secure,” Estonian Army Lt. Simmo Saar told The Daily Signal. The exercise—called Baltic Jungle—was part of Operation Atlantic Resolve, a NATO mission involving U.S. and European partners meant to strengthen cooperation and deter Russian aggression in the wake of Russia’s 2014 invasion of Crimea and ongoing proxy war in eastern Ukraine. In Estonia, where Soviet occupation is a living memory, Russian revanchism is considered an existential threat. The increased footprint of NATO military forces in the Baltics under the enhanced forward presence rotational deployments announced in Warsaw in 2016, and the constant drumbeat of military exercises across the Continent under Operation Atlantic Resolve are, therefore, reassuring gestures to Estonians—and meant to serve as a message of deterrence to Moscow. On Aug. 10, as part of Baltic Jungle, NATO air, ground, and cyber forces simulated the defense of Estonia from a hybrid warfare attack. It’s what the U.S. military calls a “multinational, multidomain exercise,” and it was the first of its kind in Estonia. Robinson was among a detachment of 270 personnel from the Air National Guard’s 175th Wing—based out of Warfield Air National Guard Base, Maryland—which was on a three-week flying training deployment to Estonia in August. The deployment was part of a state partnership program that dates back to 1993. 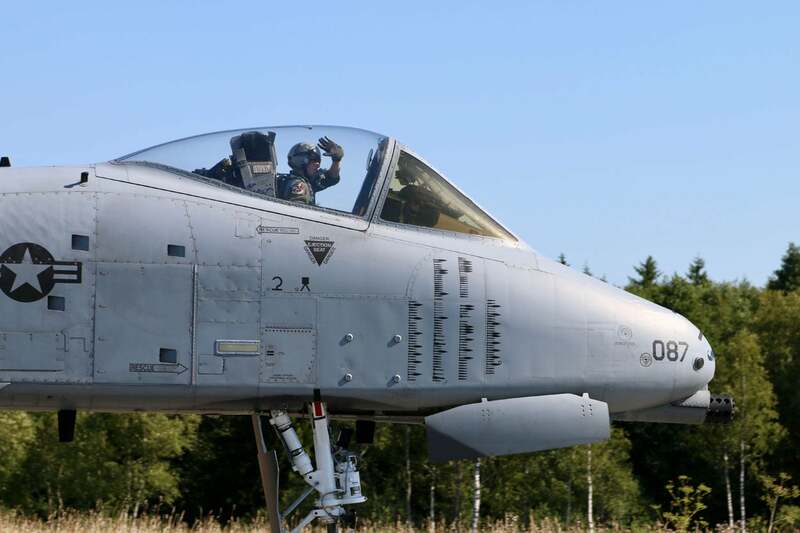 During the Baltic Jungle exercise, a team of 35 U.S. cyber operators at Ämari Air Base, working alongside five of their Estonian counterparts, responded to a simulated cyberattack in which a hypothetical adversary had infiltrated malware into computers that run maintenance diagnostics on the U.S. A-10s. 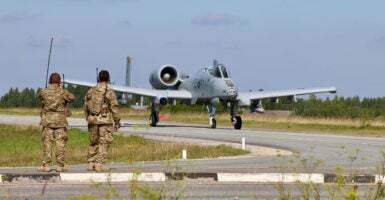 “[The A-10] is very much a vulnerable platform and we need to be able to protect it just like we did in the old school where we would put a bunch of security forces around an airplane,” said Col. Jonathan Sutherland, U.S. Air Forces in Europe-Air Forces Africa director of communications. “Now we have to have those cyber defenders around an airplane,” Sutherland said. 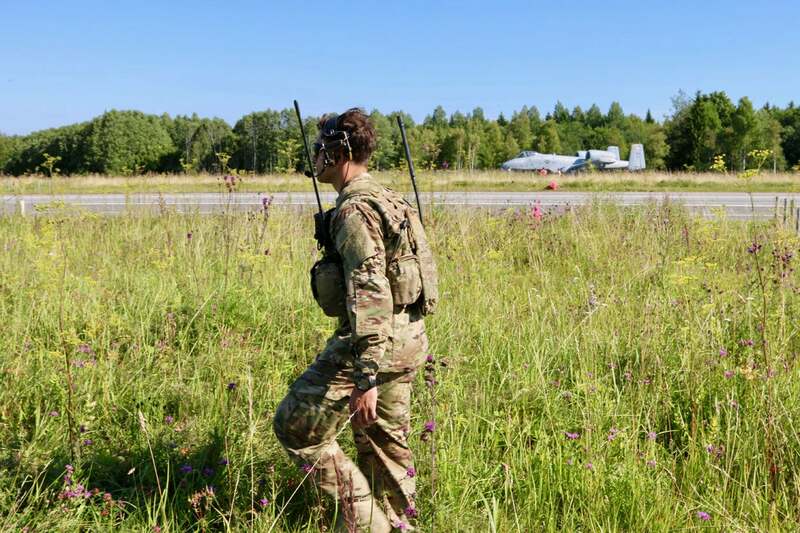 While the cyber operators worked from Ämari Air Base, airborne NATO combat units simulated an airfield seizure at a nearby highway in the rural Estonian countryside. In a choreographed flurry, helicopters swooped in, troops spilled out, and the helicopters lifted away. Then, under the watchful eye of U.S. and British commandos, 16 U.S. Air Force A-10s practiced takeoffs and landings on the cordoned-off roadway. The interwoven use of a Cold War-era weapons system like the A-10 with modern cyberwarfare assets is a bellwether for the kind of complex, multidimensional defensive combat tactics NATO needs to hone to defend itself from modern hybrid warfare threats. Russia’s modern hybrid warfare doctrine is a modern take on the Soviet Union’s strategy of “deep battle.” Hybrid warfare is not covert warfare. 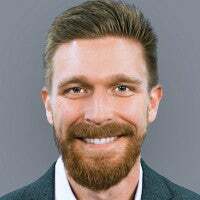 Rather, it’s the combined use of conventional military force with other nonkinetic means such as cyberattacks and propaganda to sow chaos and confusion among the enemy—both on the battlefield and deep behind the front lines. Hybrid warfare is an evolving threat spanning every combat domain. Consequently, the U.S. military and its NATO allies have to be adaptive, not hamstrung by rigid battle plans, and able to anticipate threats before they manifest. The Baltic Jungle exercise represents the kind of forward thinking required of U.S. military commanders and the eclectic skill sets required of its operators to successfully defend against a hybrid warfare attack. “We always have to be looking forward,” Air National Guard Maj. Gen. Jon Kelk said. 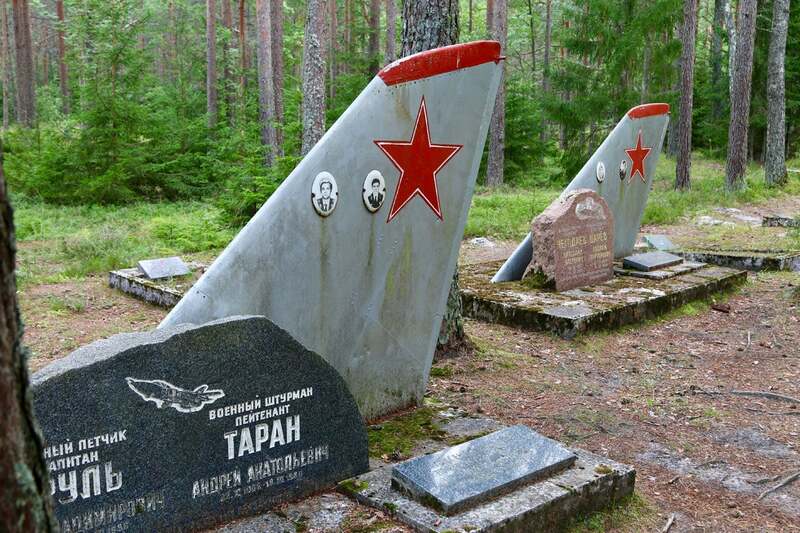 Memorials to Soviet pilots outside Ämari Air Base, Estonia. After 16 years of focus on counterinsurgency operations in Iraq and Afghanistan, the U.S. military, as well as its NATO allies, are dusting off old Cold War skill sets while simultaneously developing new, uniquely modern, warfighting skills to match the hybrid warfare threat. The post-9/11 warfare era is not over. Sixteen years after the Sept. 11, 2001, terrorist attacks, counterinsurgency operations are still ongoing in Afghanistan and Iraq. But “near-peer” state adversaries have re-emerged as potential military threats from the South China Sea to the Baltics. Russia’s 2014 invasion of Crimea and ongoing proxy war in eastern Ukraine rattled NATO’s three Baltic members—Latvia, Lithuania, and Estonia—as well as neighboring Poland. Collectively, these four NATO countries treat Russian military aggression as an existential threat. Estonia, for its part, has already felt the wrath of Russian cyberwarfare. In 2007—during a row with Russia over the removal of a World War II Red Army statue—Estonia was hit by a massive cyberattack. It was the first time a cyberattack affected an entire country. Evidence suggested Russia was behind the attack, but the Kremlin said it wasn’t involved. The 175th Wing’s Estonian deployment was funded by the European Reassurance Initiative. The Obama White House began the European Reassurance Initiative in June 2014 to fund operations in Europe to deter Russian military aggression in the wake of Moscow’s 2014 invasion of Ukraine. President Donald Trump has continued the program and recently proposed increasing its budget, underscoring a steady U.S. pushback against Russian aggression in the region. Operation Atlantic Resolve, which falls under the European Reassurance Initiative funding umbrella, comprises a broad gamut of exercises and temporary deployments of U.S. military hardware and personnel throughout the Continent. It also includes funds to improve NATO infrastructure throughout Eastern Europe. Facilities at Ämari Air Base in Estonia, for example, have been renovated with Operation Atlantic Resolve funds. U.S. Air Force A-10 “Warthogs” have played a key role in post-9/11 counterinsurgency campaigns in Iraq and Afghanistan. U.S. military personnel in Europe carefully avoid singling out Russia by name as the military threat they’re training to fight against. They say their focus on countering hybrid warfare is reflective of evolving threats worldwide, not just the one Russia poses to Eastern Europe. “It is a changing world, I’d say all across all world, not just in Europe,” Sutherland said. Yet, with news reports of tens of thousands of Russian troops massing in nearby Belarus for Russia’s Zapad military exercises this month—and with Russia’s proxy war in Ukraine still killing people daily—exercises like Baltic Jungle are as much about sending a diplomatic message as they are about honing combat skills. The A-10 is a Cold War-era weapons system conceived in the 1970s to destroy Soviet tanks in the forested battlefields of Eastern Europe. After 16 years of playing a key close air support role for U.S. and NATO troops in Iraq and Afghanistan, the A-10 is back to its roots, so to speak, preparing for the mission, and the approximate battlefield, for which it was originally intended. During the Cold War, NATO planners considered the Fulda Gap—a lowland corridor northeast of Frankfurt, Germany—to be the most likely route for a Soviet tank invasion of West Germany. “The Fulda Gap, I mean that’s what I trained for in 1991,” Staudenraus, the 175th Wing commander and A-10 pilot, said. Yet, NATO isn’t training to stop a tank invasion at the Fulda Gap anymore. Now, in the age of hybrid warfare, defending NATO from a theoretical Russian attack requires more sophisticated tactics from Cold War-era weapons systems like the A-10. 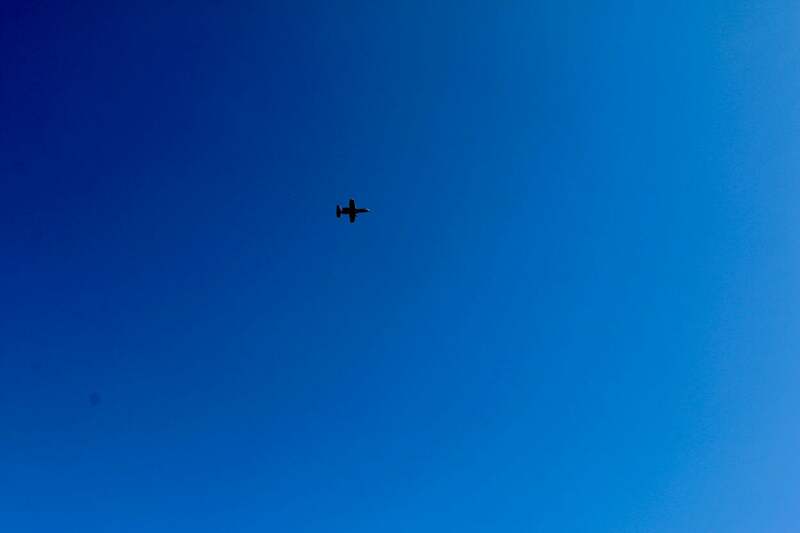 A U.S. Air Force A-10 flies over Estonia. The former Soviet country has been a NATO member since 2004. The A-10 has been on the congressional chopping block for years. In 2014, Congress debated retiring the A-10 to siphon funds for newer, more advanced warplanes, such as the F-35 and the F-22. But the A-10 was spared. The 1970s-era warplane remains a staple among U.S. military operations worldwide, and it likely will for years to come. In July, the House Armed Services Committee allotted $103 million in the fiscal year 2018 National Defense Authorization Act to keep the A-10 flying. The money was tagged to restart production of A-10 wings as part of an upgrade package for 110 of the Air Force’s 283 Warthogs. The A-10 has been modernized over the decades to perform a wide variety of missions, well beyond the destruction of Soviet tanks in the Fulda Gap for which it was originally designed. Many U.S. troops and Marines who fought in Afghanistan and Iraq can testify to the devastating ground-level effects of the A-10’s 30 mm gatling cannon on enemy forces. The A-10 has also proven particularly lethal in operations against the Islamic State terrorist group in Iraq and Syria. In that war, A-10 pilots have conducted air interdiction missions—effectively hunting for targets of opportunity. Using both the 30 mm gatling cannon and precision munitions, the A-10 proved to be a bane for ISIS militants. Staudenraus said the A-10 was uniquely suited to the mission and the environment NATO forces currently face in Eastern Europe. The A-10 is probably one of the Air Force’s least sophisticated warplanes. It’s slow, and stealth was never a factor in its design. But the plane is extraordinarily suited to fulfill the role for which it was designed. It’s one of the most durable and survivable aircraft ever built. Its pilots sit in a titanium bathtub, shielding them from ground fire. The A-10’s straight wings and low speed allow a tighter turn radius than other fighters, permitting pilots to circle back around to strafe or bomb enemy positions more frequently. And the A-10 flies low. Pilots can therefore visually identify friendly forces and the enemy, reducing their reliance on sensors that can diminish situational awareness. The other legendary capability the A-10 brings to the battlefield is the plane’s 30 mm, seven-barrel gatling cannon, which can fire up to 4,200 rounds per minute.